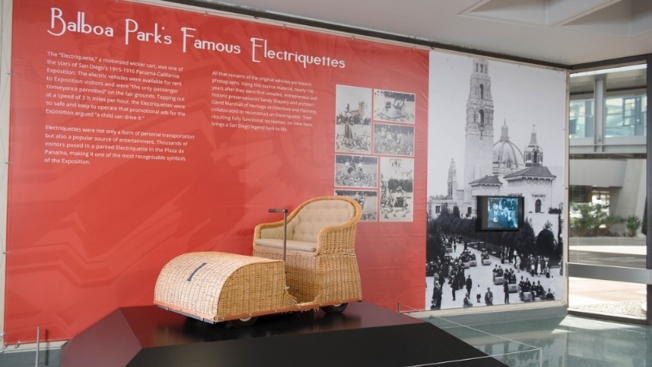 A replica of the famous wicker “Electriquette,” which transported fairgoers at the 1915 Exposition, is on display at a new art exhibit dedicated to Balboa Park at the San Diego International Airport. 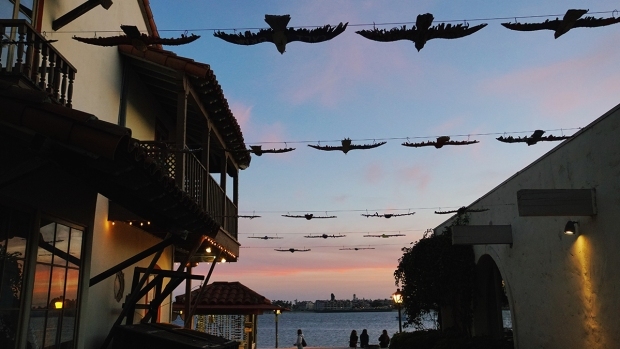 Travelers at the San Diego International Airport have something new to fill their time between flights: a new art exhibit dedicated to the history of the iconic local landmark, Balboa Park. It took one year to assemble and comes just in time to celebrate the 100th anniversary of Balboa Park with various pieces representing the 1915 Panama-California Exposition. All artwork and pieces included in the exhibit memorialize the growth of Balboa Park over the last 100 years. County Regional Airport Authority, in a press release. Among the artwork that is featured are original costumes from Old Globe Theatre productions and decorative lighting fixtures from artist Jim Gibson. A unique element of the exhibit is the replicated Electriquette, which was a motorized wicker cart that was the only allowed means of transportation for fairgoers at the 1915 Exposition at the park. It could only travel at about three-and-a-half mph, but was still a crowd favorite at the fair. Pictures were once the only remains of this classic mode of transport, but historic preservationist Sandy Shapery and architect David Marshall were able to recreate the cart. Featured 1960’s artist, Guillermo Acevedo, illustrated San Diego landmarks like Balboa Park and Santa Fe Depot through his drawings. 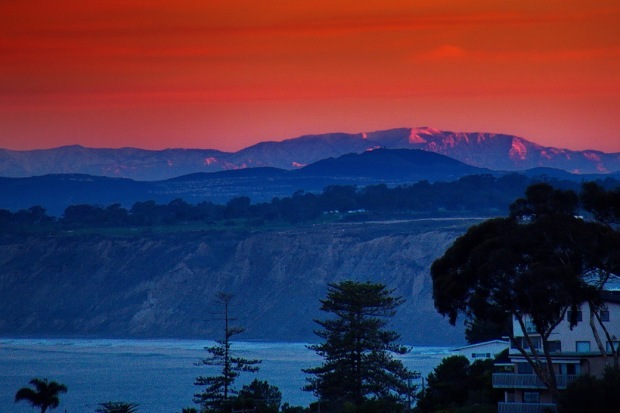 His pieces on display at the new airport exhibit “honor the diversity and beauty of San Diego and the surrounding region,” according to the San Diego Airport Authority. The airport’s art program began in 2006, and this exhibit is the latest in the line of exhibits showcased at the terminals.